For all charts (single wheel or bi-wheel): Natal, Transit, Progressed, Solar Arc, Returns, Synastry. 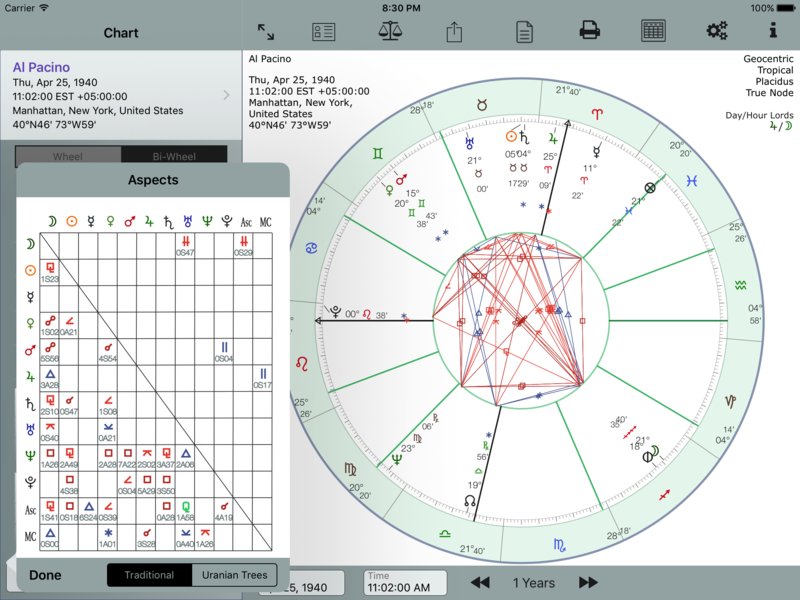 Midpoint planets/points permitted; Moon, Sun…Pluto, Asc, MC, North Node. Note that the planetary selection is also restricted by the choices made by the Displayed Planets menu. 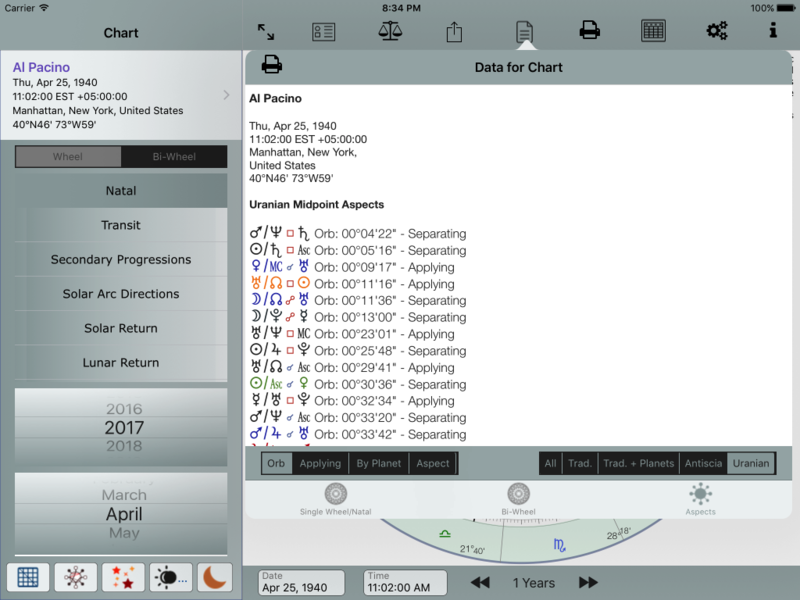 For example if Pluto is not selected in the Displayed Planets table then Pluto midpoints are not calculated. Show orb and aspect, applying or separating for trees, and table. Choice of all major hard aspects (0, 90, 180) to midpoints or include 45 and 135 degrees. This is not affected by the Displayed Aspect/Lines choices. 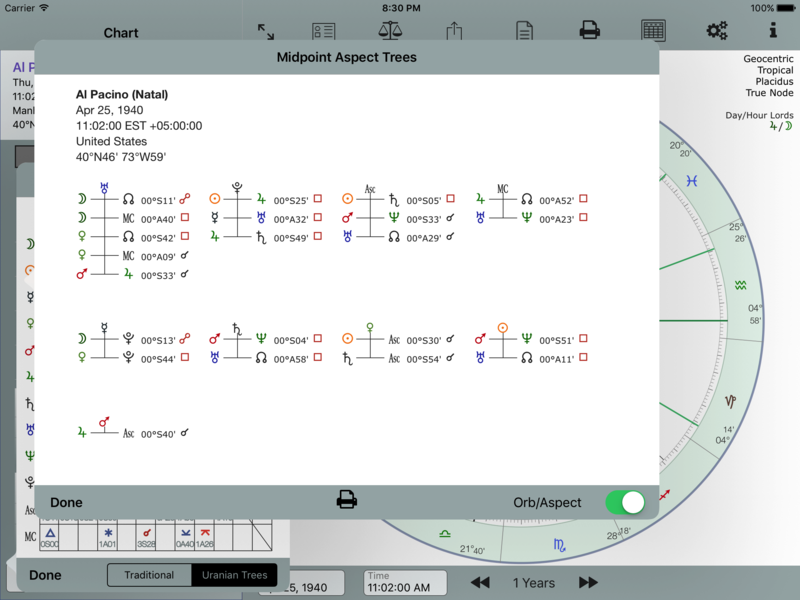 Air Print Midpoint Trees and midpoint aspect table records. These are progressed or directed planetary aspects to natal planetary/point midpoints. For example, suppose the secondary progressed Sun to be at 15 degrees Aries. If natal mercury is at 0:24 degrees Aries and natal Mars is at 29:30 degrees Aries a midpoint will be recognised. Sun – Mercury/Mars. Only 9 aspects per tree can be shown. Usually, this is plenty. If necessary, reduce the number of potential aspects by selecting only major hard aspects: 0, 90, 180. This can be found in the Uranian settings.